ICN - considering 4 weekly nonstop flights with the B 772ER initially which would then be increased to daily within a year. KUL - to be flown daily via SIN using a B 744 i.e. extension of BA 11 / 12. EZE - services to restart from 2009 with nonstop flights from LHR due to the improvement in the country's economy since the 2002 crash. GIG - nonstop 3 weekly flights to begin from 2009. HKG - 4th daily frequency being studied. YVR - double daily year round being studied. JNB - to be increased from double daily to 17 weekly from 2009. GCC - all flights from 2010 to BAH, AUH, DOH & MCT will be terminator flights flown by the B 772ER. AMD & ATQ - both routes are being carefully studied. Emirates has announced that it will be expanding its flights to Australia from 2008 with major increases planned for Brisbane, Sydney and Melbourne. BNE - new daily nonstop flights from DXB effective Oct 2008 using the A 345 which will be in addition to the daily B 773ER flight flown via SIN. MEL - third daily frequency to be introduced out of which 1 of the 3 flights will be flown with the A 380 effective 2009. SYD - third daily frequency to be introduced out of which 2 of the 3 flights will be flown with the A 380 effective 2009.Analysis :Very smart move by EK, as the demand is there to support their flights to SYD especially. The feeling is that there are purposely doing this in a rapid manner to counter effectively any new expansion planned by EY & QR in Australia over the next 2 years. According to officials who work for Air India, the airline is seriously looking at placing another larger order with Airbus or Boeing for 10-15 ultra large aircraft with the Airbus A 380 likely to win the order. AI has also decided that it is very keen on expanding its domestic and international cargo operations thus will be converting many of its owned Boeing 747-400s into freighters once new aircraft have fully replaced them. Boeing has proposed to Air India, a counter offer for a dozen Boeing 747-800s + a dozen more Boeing 777s as it feels that the carrier should focus more on frequencies of flights to certain destinations rather than increase capacity. To make it more attractive, Boeing should offer AI a package which includes buying back their B 744s as part of AI's order for B 748Is and B 748Fs which will ultimately result in the B 744Fs being replaced by new B 748Fs. Also AI cannot fill up even 75% of an A 380 year round if they flew daily nonstop from BOM or DEL to any U.S. East Coast city or even LHR due to excess competition and low brand following of the airline. The only way, AI can make good use of the A 380's excess seating capacity, is by making a hub in the UK ( i.e. MAN-Manchester) for onward flights to USA as then the capacity of the A 380 can deployed effectively for 2 different market segments which see high density demand to/from India. At the end of the day though, one reckons that Air India will order the A 380 for prestige reasons largely in order to stay competitive with EK and the EU carriers who will be using the A 380 to BOM & DEL in the future. However, to keep everyone "Uncle Sam" happy, a few B 777s or B 787s too will also be ordered. JFK - double daily B 772ERs. EWR - double daily B 763ERs. NRT - daily B 772ER nonstop. LAX - new daily nonstop flights with the B 772ER. YUL - new daily nonstop flights with the B 763ER. KIX - new 4 weekly nonstop flights with the B 772ER. GIG - new 3 weekly nonstop flights with the B 763ER. MIA - daily flights with the B 763ER. CCS - daily flights with the B 763ER. BOS - daily flights with the B 763ER.ORD - daily flights with the B 763ER. GRU/EZE - daily flights with the B 772ER nonstop. DXB - daily flights with the B 763ER. Continental Airlines has released its plans for new flights to London Heathrow from May 2008 onwards. There will be 4 daily flights from nonstop from its EWR & IAH hubs (double daily from each hub airport respectively) using a B 772ER + B 762ER. Singapore Airlines has announced that due to excellent loads especially in the premium cabins on its Barcelona and Milan bound flights, it will be increasing services on the route from the current 4 times a week to daily effective March 30th 2008. The route is flown using their new 3 class configured Boeing 777-300ER. US Airways has also released its flight schedule for London Heathrow which includes only a single daily flight from its PHL hub using an A 333. On the other hand, the airline's CEO has confirmed to his employees via an internal newsletter that the carrier will be receiving 9 additional A 330-200s by 2011. Seven A 332s will be bought brand new from Airbus soon and the remaining 2 will be ex SWISS planes leased from ILFC with delivery expected in 2009. Ocean Air of Brazil has announced that it has placed a US$ 2.7 billion order with Airbus for 7 A 332s + 14 A 319s + 7 A 320s for which a formal announcement will be made this week. Emirates's order for 50 Airbus A 350-900s + 20 Airbus A 350-1000Xs + 12 Boeing 777-300ERs + 3 more Airbus A 380s (ordered 58 in total) + took 50 options on the A 350 family line. Once again, EK stole the show by placing the largest ever order in commercial aviation history worth over US$ 31 billion. Some might say that the recent order placed at the DXB air show is insane but if one looks at it in hindsight that is not the case. The 70 A 350s that EK ordered will be used to replace 61 aircraft currently in its fleet i.e. 29 A 332s + 8 A 343s + 3 B 772As + 9 B 772ERs + 12 B 773As. Therefore to cater for further expansion, EK has basically placed only an extra 24 wide bodied aircraft on order. The A 359s will be a direct replacement for the A 332 + A 343 + B 772A + B 772ER fleet whilst the A 351 replaces the B 773A fleet. Looking at it from a strategic point of view, this is an excellent move by EK as a vast majority of their short/medium haul flights will revolve around one airplane type i.e. the A 350 and not 3 different types as is the case today (A 332 / A 343 / B 777). This will result in huge cost savings not only in terms of crew training, crew rostering but more so in the areas of engineering and maintainence. Many people including myself were also expecting an order for 10 Boeing 747-800s (+10 options) but that didn't materialize as apparently Boeing refused to give in to EK's demands of shortening the length of the plane which would increase its nonstop flying capability which would allow it to fly without any payload penalty DXB-LAX/SFO nonstop. As a result, the B 773ERs won the order for 12 aircraft. As far as the A 380's go, EK firmed up 8 options it announced at the Paris 2007 air show held in July + ordered 3 extra at the DXB air show. This new order brings the total number of A 380s ordered by EK to a whooping 58! I have a suggestion which EK could look into with regards to 2 routes that the A 380 can be useful for. Those 2 routes are DXB-CDG-LAX and DXB-CDG-SFO. Why you may ask? Simple, Air France currently enjoys a lucrative monopoly position on both routes as no other airline flies from CDG nonstop to the U.S. West Coast hence both LAX & SFO have proven to be high yielding routes for AF for the last 4 years in all cabins. By EK ordering dozens of Airbus aircraft over the last decade or so which in turn created thousands of extra jobs in France + helped the French economy through these orders, it can effectively lobby the French Government to allow it to fly with 5th freedom traffic from CDG to USA and give AF a run for their money on SFO & LAX routes. Since EK's business philosophy calls for double daily flights to all their long haul destinations, have one nonstop flight flown from DXB to the U.S. West Coast with the Boeing 777-200LR and have the other one flown with the A 380 via CDG. In both these U.S. markets, EK has good brand recognition amongst the low yielding and high yielding passengers thus by offering an attractive in-flight product on board its A 380s, it stands to do well in this market segment with the A 380. Qatar Airways's order of 30 Boeing 787-800s + 5 Boeing 777-200LR Freighters + 20 options for the B 787 family line. This order was arguably the worst kept secret in the airline industry for nearly a year and finally at the DXB 2007 air show, it was officially announced much to Boeing's joy. Unlike EK's A 350 order which will largely replace an already existing aging fleet, QR's order on the other hand for the B 788s is three fold. Some of the B 788s will indeed eventually replace the oldest A 332s from 2013 onwards but will largely cater to future expansion as well as provide a "stop gap capacity" measure for 2-4 years until their A 350s start arriving. By ordering the B 788, new 'medium density' long haul routes can now be flown nonstop from its DOH hub which do not need the excess capacity offered by their A 346 nor B 773ER. Routes that come to mind are DOH-PER nonstop, DOH-ORD nonstop, DOH-YYZ nonstop, DOH-IAH nonstop and DOH-GIG nonstop. However, one feels that a majority of routes that the B 788 will be used for are regional routes within the Middle East and Indian subcontinent region + routes to Europe where the seating capacity of the A 332 is found to be a bit high! Another smart order placed by it was for 5 B 772LR freighters. Unlike the world passenger market which sees a high and low seas on, the world cargo market is supposedly always in high season mode as its business revolves around 'world trade'. The location of QR's DOH hub i.e. in between Europe/Africa and Far East Asia, provides QR Cargo with the ideal set up to tap an ever growing market by air lifting freight from one corner of the world to the other. Dubai Aerospace Enterprises (a new leasing company) order of 70 A 320s + 30 A 350s + 10 B 777-300ERs + 70 B 737NGs + 5 B 747-800Fs + 15 B 787s. DAE also signed a deal with EK which entailed it buying 8 A 332s from the airline for US$ 500 million and then leasing it back to the carrier. DAE is a new leasing company being supported by Emirates & the DXB Govt. For a start up, they have announced themselves as a future force to be reckoned with by placing this large order for narrow & wide bodied aircraft. What is pleasing to see is the variety of aircraft ordered by DAE which are the most popular ones for airlines to use in the future and present. With regards to the B 773ERs on order, they can easily find interested customers ranging from the GCC airlines to Indian carriers, PK, and even the North American carriers who are actively scouting the market for suitable aircraft to cater towards their long haul international expansion from 2011 onwards. As far as their order of 15 B 787s go, they should look at placing them with airlines who are looking for medium density long haul aircraft to replace B 767s / AB6s / A 310s etc as well as those airlines who feel that the capacity of their A 330s / B 777s is too big for certain medium haul flights. The latter point bears fruit for Saudia Airlines who find it extremely difficult filling up their B 772s on EU bound flights. The former point applies to airlines such as PIA and AZ who need B 787s asap to replace their aging fleet of A 310s and B 763ERs respectively. With regards to the A 350s they've ordered, DAE should actively pursue contracts with airlines that need to replace A 330s / B 777s & A 340s from 2015 onwards. Airlines that fall into this category are MEA, VN, UL, SAA, TK, MH, GA, TG, MS & PAL. Other types of customers they should consider going after are those that need A 350s to fuel robust international expansion such as Kingfisher Airlines, Oman Air etc. Oman Air's order for 3 A 333s + 2 A 332s at the DXB Air Show. This order has come to a surprise to many as everyone expected the order to consist solely of A 332s. Nevertheless, one can easily make out as to why the A 333s were ordered. The reason being is that this aircraft will be dedicated on WY's high density routes which are JED, DEL, DAC and Kerala. I would bet on the 2 A 332s being dedicated for same plane daily service from London via MCT to BKK. For WY, I would recommend that they dedicate one A 333 for a daily DEL-MCT-JED or DAC-MCT-JED flight as both flights will prove to be very popular. Another reason where the A 330s will come in handy for WY is the cargo carrying capability of the A 330s on these regional routes. Twelve tons of cargo can be easily carried in the belly on A 332 / A 333 operated flights and this additional form of revenue will come in handy big time on cargo friendly routes to DAC, Kerala, JED and BOM/DEL. Yemenia Airways order for 10 A 358s at the Dubai Air Show eating 18 in business and 265 in economy i.e. 283 in total. IY has ordered these aircraft to fully replace its fleet of 2 A 332s + 4 A 310-300s from 2015-16 onwards as well as to cater for future international expansion. FYI, besides its main hub of SAH-Sanaa, Yemenia also has a smaller scale hub at DXB from where it flies to the Far East with 5th freedom traffic rights. They have one interesting yet weird route i.e. SAH-DXB-KUL-CGK flown twice a week with the A 332. Hopefully by the time the A 350s start arriving, such routings will cease to exist and either nonstop or flights via DXB nonstop will be flown! Keep in mind that IY is currently in expansion mode with new routes to CAN, MNL & MXP from Spring 2008. 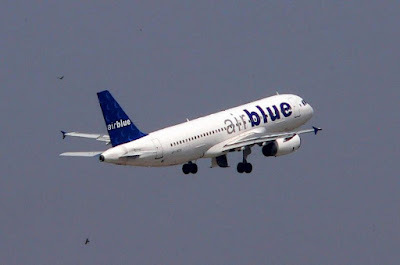 Airblue of Pakistan order for 8 A 320s at the DXB air show. It is really pleasing to see a privately owned Pakistani airline taking the initiative of expanding its fleet of new planes bought directly from the manufacturer rather than leasing old used planes like its rivals Aero Asia and Shaheen Air do so. This order caught me by surprise as there was no indication what so ever that ED was going to be placing such a big order which in total net value was the second largest single order placed by a Pakistani airline. The record is held by PIA when it ordered 8 new B 777s from Boeing in October 2002. The only thing that surprised me of this order was that no A 321s were ordered. It would have been nice if 3-4 A 321s were ordered as this aircraft type is the ideal one for ED to fly to the Middle East & BKK nonstop from KHI/LHE/ISB/PEW as not only can it carry 190 passengers but also 4-5 tons of cargo which is an valuable source of additional revenue. Apart from that, am happy to have read of this order being placed.